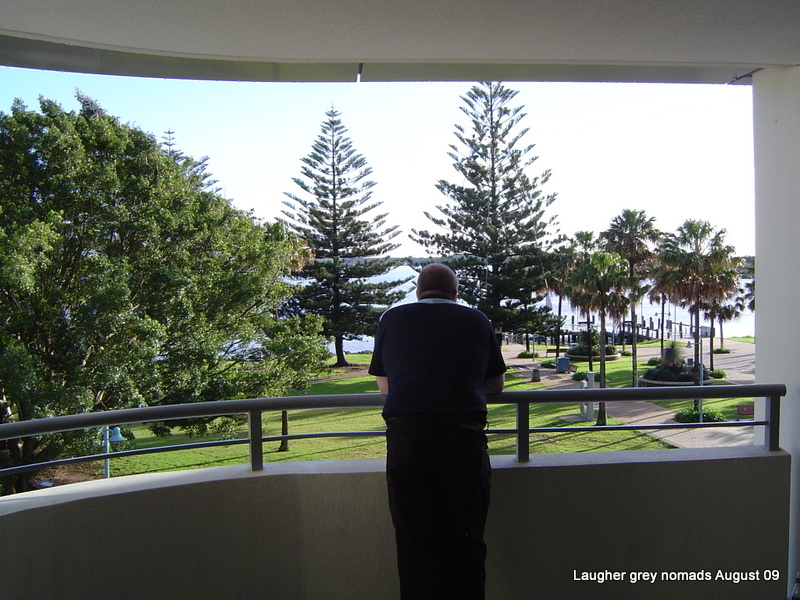 Laughers Lost in Oz » – A long-held dream of wandering around Oz is realised. If you can’t guess who this is – read on, all will be revealed. Back in early October a few of the Emerald riders set of for Blackwater Social Riders Club. 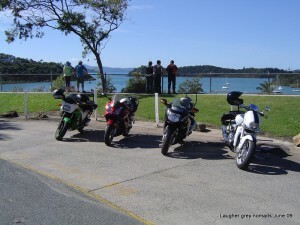 The occassion was their annual charity poker run. 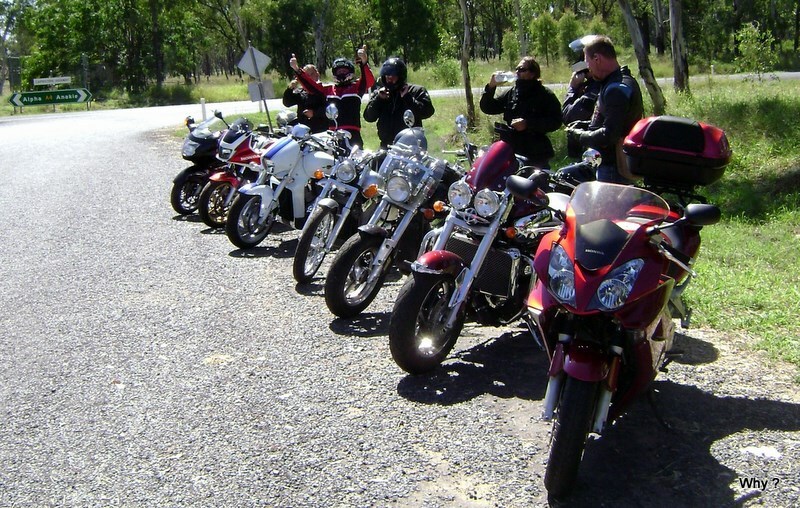 Riders gather at either Rockhampton or Clermont, and head back to Blackwater, collecting cards for their poker hand at various checkpoints (aka pubs) along the way. Marc and I joined the group heading to Rocky – about 20. What a surprise to find 80 bikes already at Rocky when we got there. A pleasant group ride back to Blackwater just in time to meet about 30 riders coming from the opposite direction. A good night was had by all – I swagged over. Last Friday night Marc and I went to their monthly meeting. 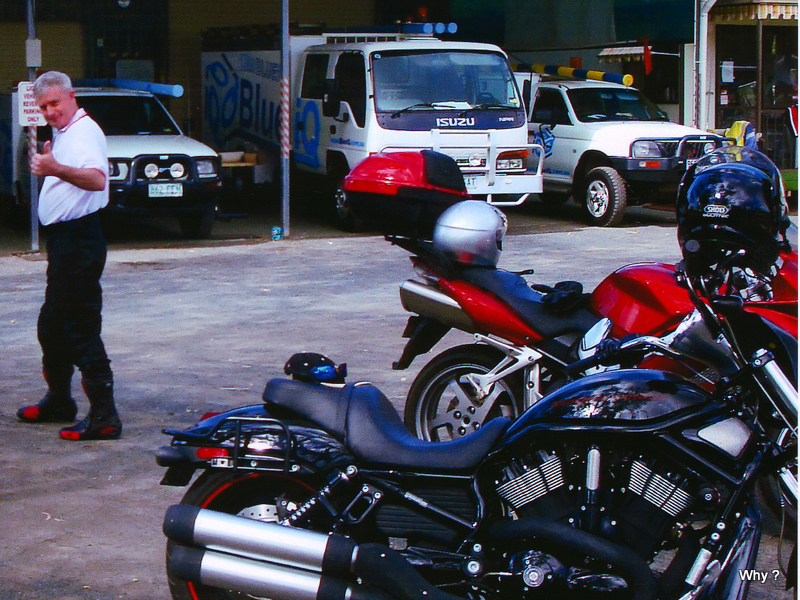 As a result of that charity ride $5,000.00 was donated to worthy causes in the Blackwater area. Him and I are now members of the club. Changes on the 2 wheel front. Things have changed a little on my motorbike front. Gone is the Honda and in its place is a big cruiser. 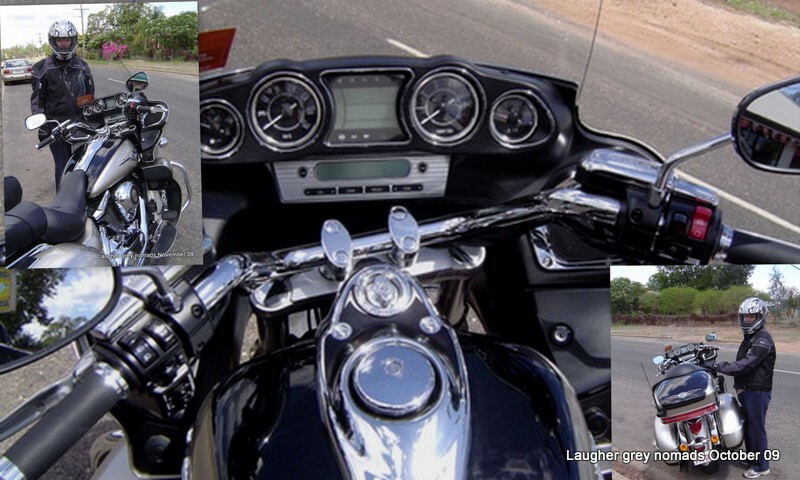 The bike is a 2009 Kawasaki Vulcan Voyager. 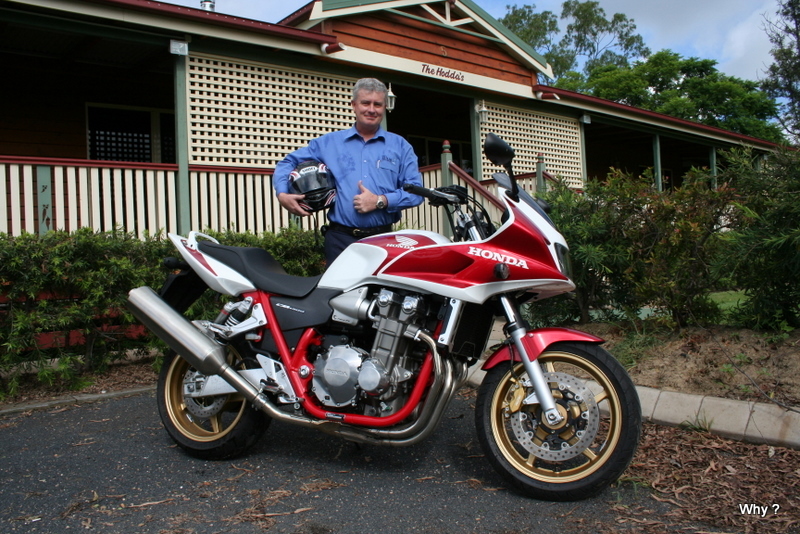 1700cc, 6 speed, belt-drive, cruise control (which I love already), ABS brakes, proportional braking, radio with Ipod connection, trip computer, 2 glove boxes, top box and panniers, etc. Not the performance of the Honda, but way more comfortable for me to ride. The cruiser is a whole lot more comfortable for me and Jan. Yes, she came for a ride with the crew last Sunday and then we had our customary “new bike bbq” – the day after I picked it up from Rocky. And today we went for a ride on our own out to the gem fields. 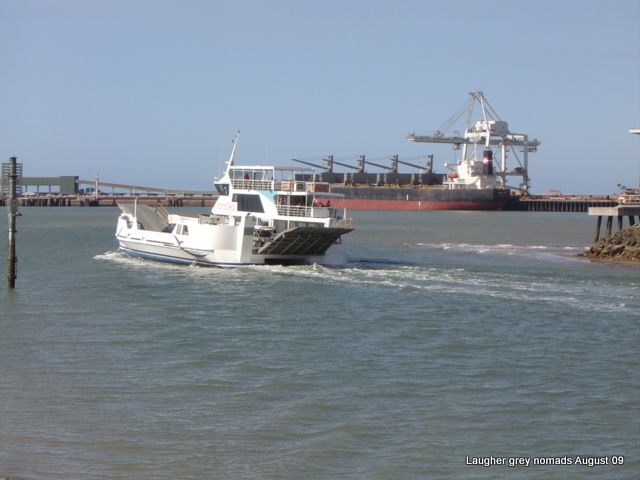 Had lunch at the Anakie pub and cruised our way back home. Oh, if you haven’t figured it out by now, Guess who no.2 is Jan. She is rigged out with her own riders jacket, gloves and helmet. 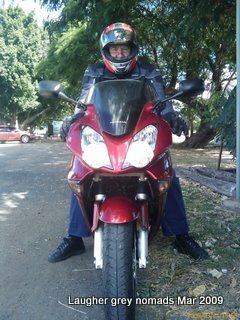 She is starting to enjoy the armchair ride that the pillion gets on this bike. No posts for nearly 2 months, and now 2 in just over a week. Lets just say those Tuross people stirred us up! I had 3 days in lieu owed to me and last week seemed like a good time to take some time off. So after making up our minds on Tuesday morning and getting approval from work, we headed off on Wednesday morning for our first trip in the CRV. Headed north for 105km through Capella to Clermont ,and then another 380km of nothing till Charters Towers. At least the speed limit is 110 for most of the “nothing”. 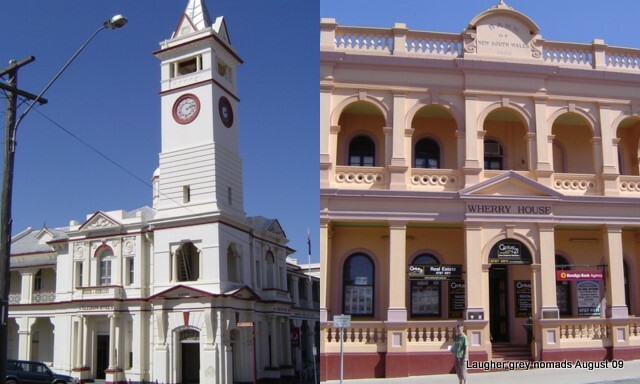 Charters Towers seems a nice older town- it has some fine examples of late 18th century architecture. Charters Towers Post Office and old Bank of NSW buildings - both 1890s vintage. Another 130km got us into Townsville. 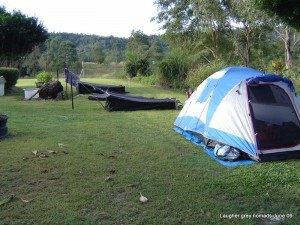 We found an old Queenslander that has been set up as a B & B and booked ourselves in for 4 nights. Lovely breakfasts with a big plate of the freshest tropical fruits you could ever imagine. 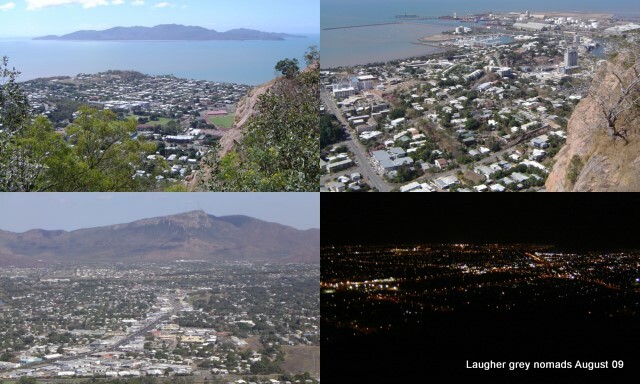 Right in the centre of Townsville Castle Hill gives magnicent views over Townsville and across to Magnetic Island which is 8km off the coast. Jan had a sore ankle so we left going to Maggy, as the locals call the island, for another time. We did the usual tourist things – a bit of shopping and a bit of sightseeing. Enjoyed lunch one day at a place called Fishermans Landing – a rustic cafe right on the river bank on the dunes behind Balgal Beach. 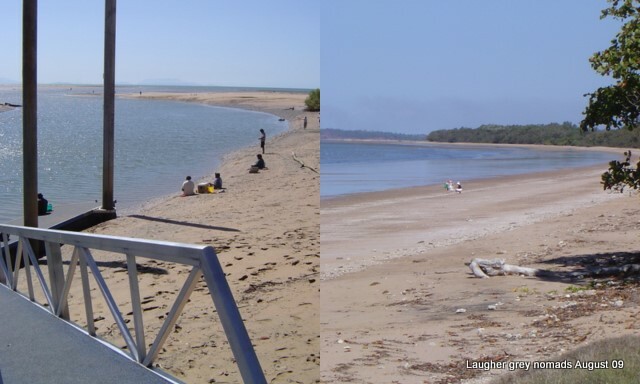 Fishermans Landing and Balgal Beach - north of Townsville. After the long drive back to Emerald all we wanted to do was unpack and relax. Just as I was unpacking the back of the CRV I got a bit of a start to see “that” Tuross couple, Di and Peter, walking towards me. 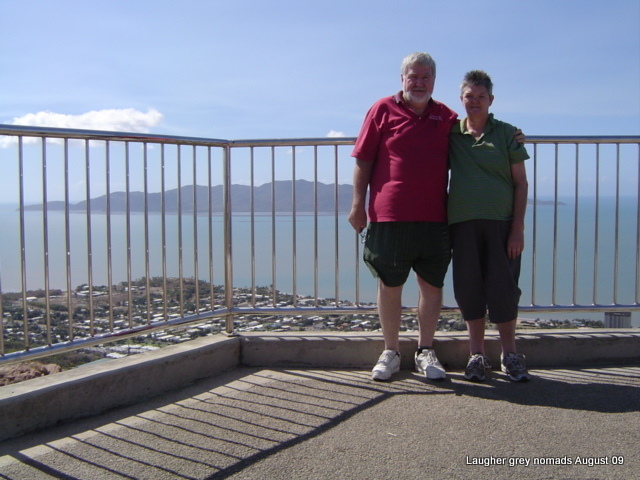 It turned out that Di had done a bit of sneeky planning by ringing my boss and the caravan park to organise a couple of nights with us before they continue their jaunt around Queensland. Good thing she did ring as our last minute plans to trip off could have spoilt the surprise. It was great to catch up with them both and topped off a long due break for us. 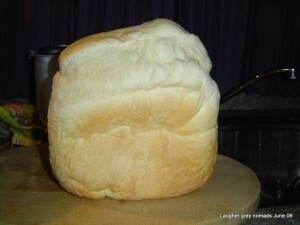 Far be it for me to bow to peer group pressure, but a very pushy couple from Tuross Head (no names) reckon the bread must be well and truly stale by now (first photo in my last post to this blog) . So just for Di and Peter, here is an overdue update. Workmate Marc and I went to Port Macquarie for an intense week of training in IP telephone systems. Drove to Rocky, flew to Sydney and then another flight on to Port Macquarie. We shared a lovely 2 bedroom studio right on the river foreshore. 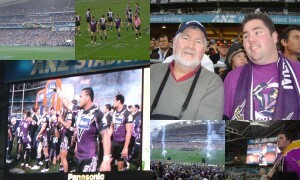 Trip home was a drag – flew to Sydney, then to Brisbane, then to Rocky, then the 3 hour drive back to Emerald. The view of the foreshore from the balcony of our unit at Port Macquarie. Oh, that's Marc blocking the view. Back in July I participated in a “mystery” ride. Some 40+ riders set out from Rockhampton on the Saturday morning. 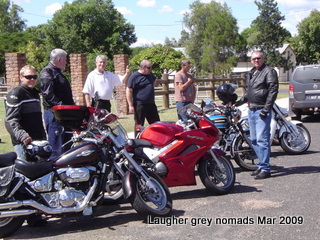 The 8 Emerald riders meet up with them at Dingo. 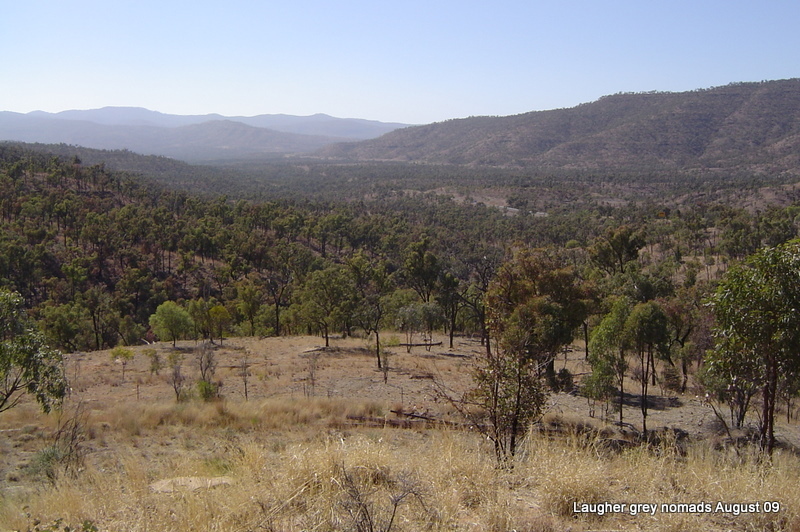 We all then headed north up the beef road, refuelled at Middlemount and onto Nebo for lunch. 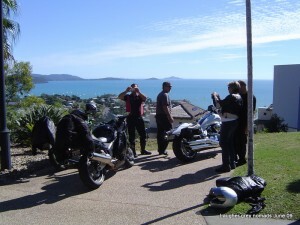 Just a short ride towards the coast for our overnight stop at the Retreat Hotel. A good night was had by all even though it got a bit cold. 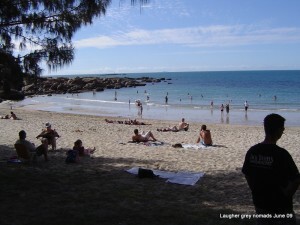 The next morning the Rocky group headed for Mackay and trundled back home down the coast. 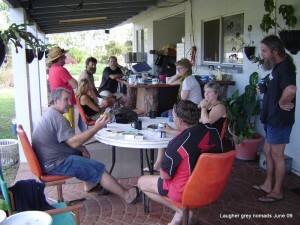 The Emerald group headed inland to Moranbah and Clermont on the way home. I’d been on the look out for another car – something a bit more comfortable to get about in, given our closest reasonable size town is 300km away and all the roads around here are far from smooth. 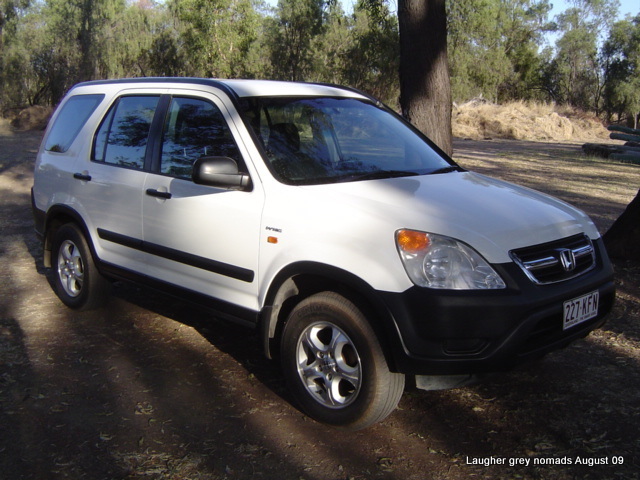 Finally found something we are happy with – a 2003 Honda CRV. Lots of room for a smallish car and excellent economy. Suzi is currently collecting dust in the boss’s yard. Came in handy for my workmate Aaron who borrowed it while his car was off the road. As part of my work I had to do communications audits of 7 banks in our area. North to Clermont, Middlemount and Dysart, south to Springsure, east to Blackwater, west to Longreach and here in Emerald. 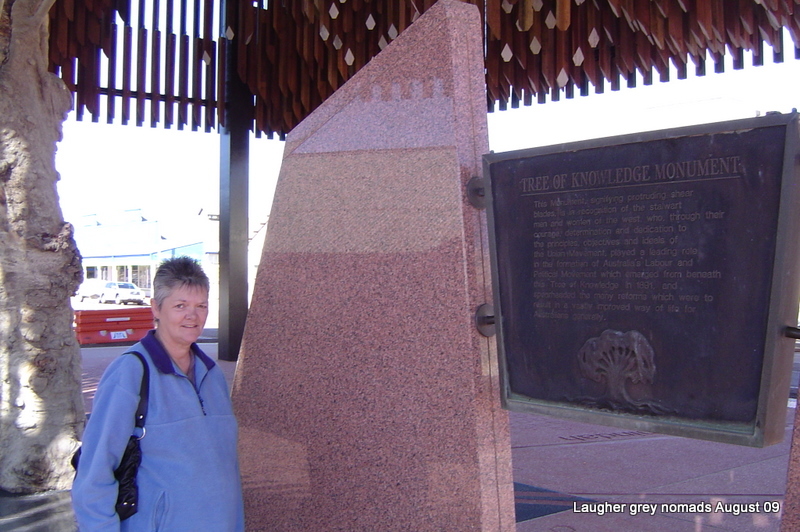 I organised the Longreach job for a Monday and took Jan out there for the weekend so we could have a look around. 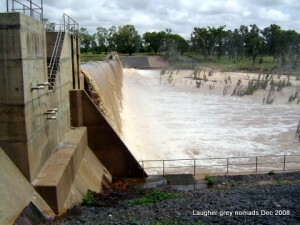 Barcaldine is 3hrs drive west of Emerald passing through a range at Boguntungan. 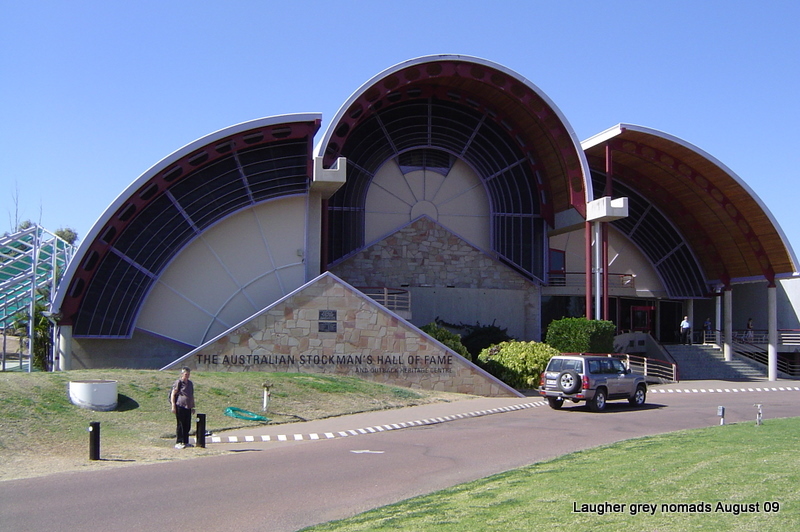 Longreach is an hour further inland. 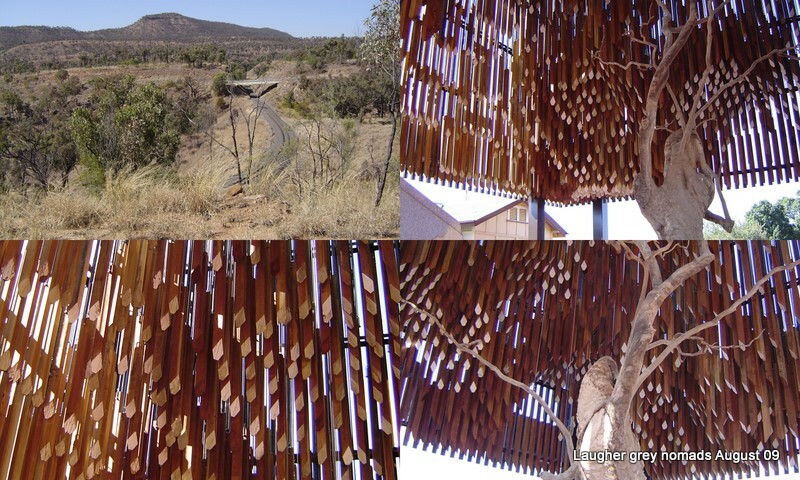 What a waste of public money the Barcaldine “tree of knowledge” memorial is. I’m told they spent over $10M on this and I have just learnt they are about to spend another $2M repairing it. Seems they used green timber and it has shrunk (doh ! ) and is in danger of spearing unsuspecting tourists. Meanwhile Barcky residents are still waiting for a small retirement village after 10+ years of chook raffles, etc. 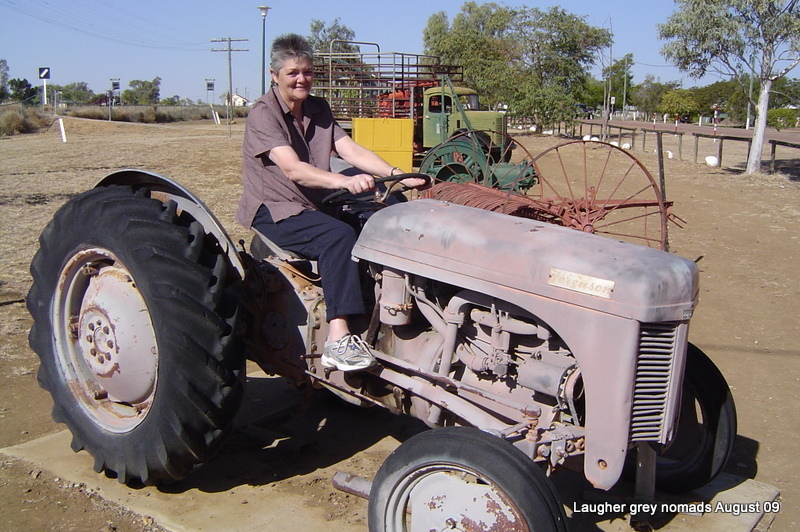 Jan revisited her childhood at Ilfracombe where there is a display of old farm machinery that stretches for 1km along the road reserve thru town. Here’s a shot for her Dad, showing her back on a grey fergy – only about 50 years since her last try. Least this time she didn’t hit the gate. Jan back on a grey fergy for the 2nd time in 50 years. Just ask her Dad about the first time. 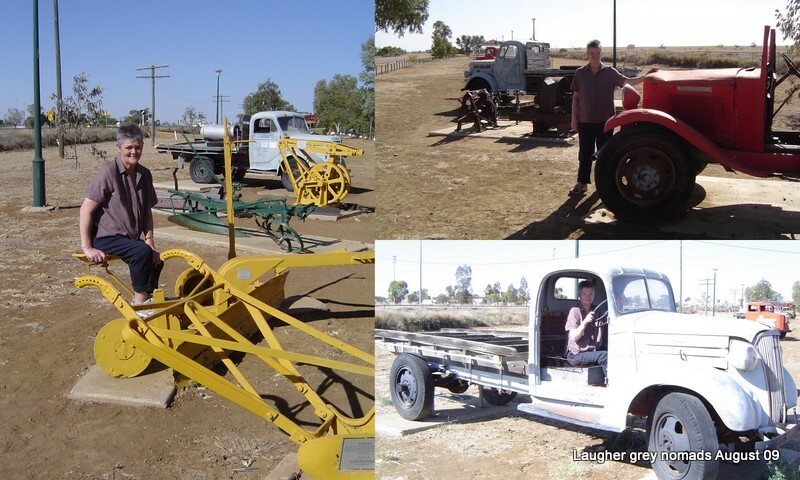 A wander through Longreach’s Stockmans Hall of fame is a day well spent. 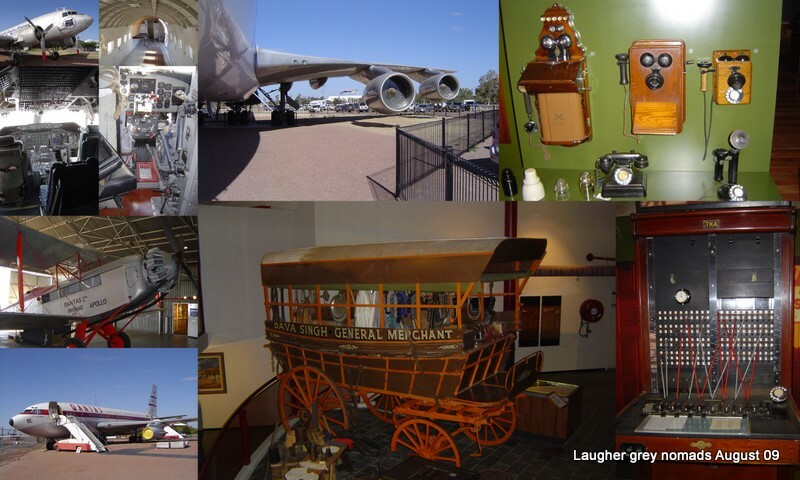 I also enjoyed the Qantas museum – Jan wasn’t keen and did a bit of retail therapy instead. 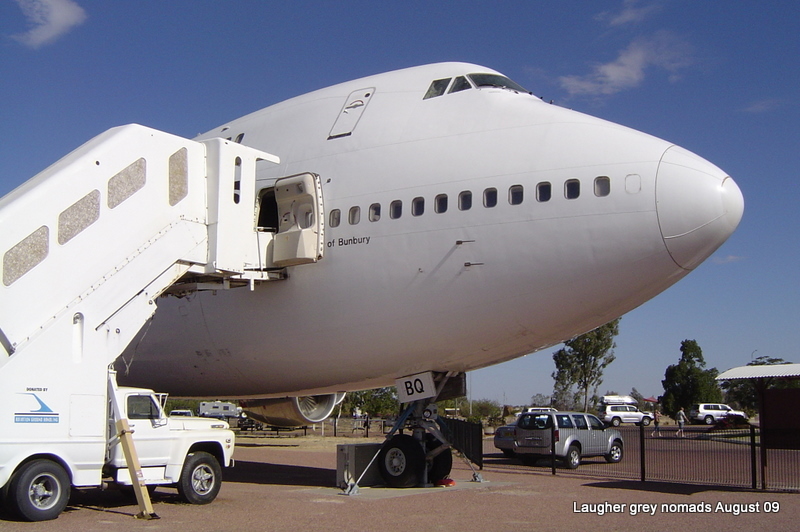 Not much else to report from Longreach. 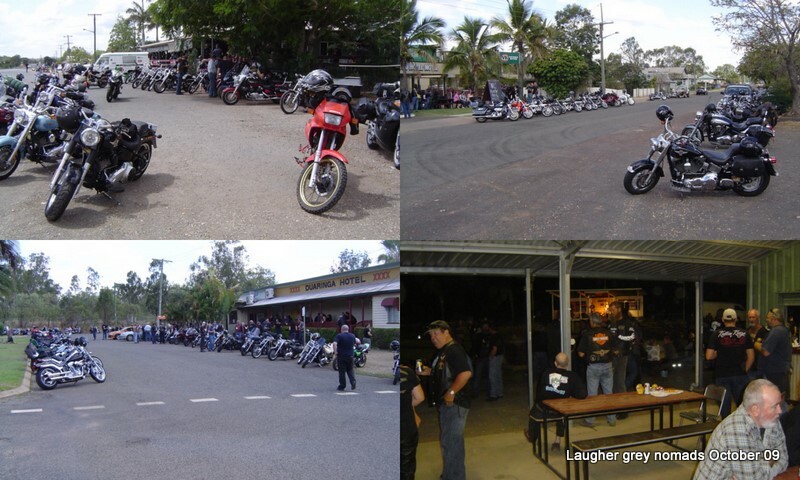 Collage of the trip out – Alpha and Barcaldine area. As expected, there is good news on the job front. I say as expected, because there has been many jobs that suited David, it was just a matter of deciding what was best for us. The only delay was that many businesses in this area shut down for 2 or 3 weeks over Christmas. After an interview on their first day back (Jan 5th) it was suggested that David shadow the boss for the rest of the week, which he did. After a bit of negotiation over the wage (try doing that on the south coast of NSW) we agreed first thing on Monday 12th, shook hands and as they say, the rest is history. Even got paid for the week before, which I thought was just a getting to know one another exercise. 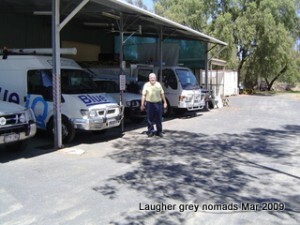 David is now working full-time for a local telecommunications contractor Blue iQ (www.blueiq.com.au). He is heading up their telephones section and busily learning all about LG PABXs. About half the work is in the mines within a 200km radius of Emerald and the other half is in shops, businesses and contractors in the same area. For the first time in 17 years I’m about to enjoy a paid public holiday. Jan has started doing volunteer work at the local Vinnies, just a short walk from the caravan park. She is also locked into a couple of classes of aqua aerobics each week at the town pool which is conveniently right next door to the caravan park. David goes for an early walk at least 4 times each week and Jan sometimes tags along – I walk too fast she says. On the other side of the ledger is a Cascade Light or three after work – I reckon I’ve earned 1 or 2 (or 3), especially on the hot days! So, Emerald will be our base for the foreseeable future. At least a year, maybe longer. We will still be wandering around on long weekends, holidays, etc. Just don’t expect updates on this blog as often as they have been till now. If our information source is to be trusted (if you can’t trust you own son, who can you trust), our congratulations go to Kellie and Nick. Our 6th great niece or nephew is due later in the year. Can’t wait till Christmas to see you all – Jan has already got the knitting needles out, so watch out. Great news! We had Christmas lunch here in the Caravan Park. Come as you were and bring a plate to share – there was about 30 of us there and a good time was had by all, with the usual Aussie tradition of way too much food. 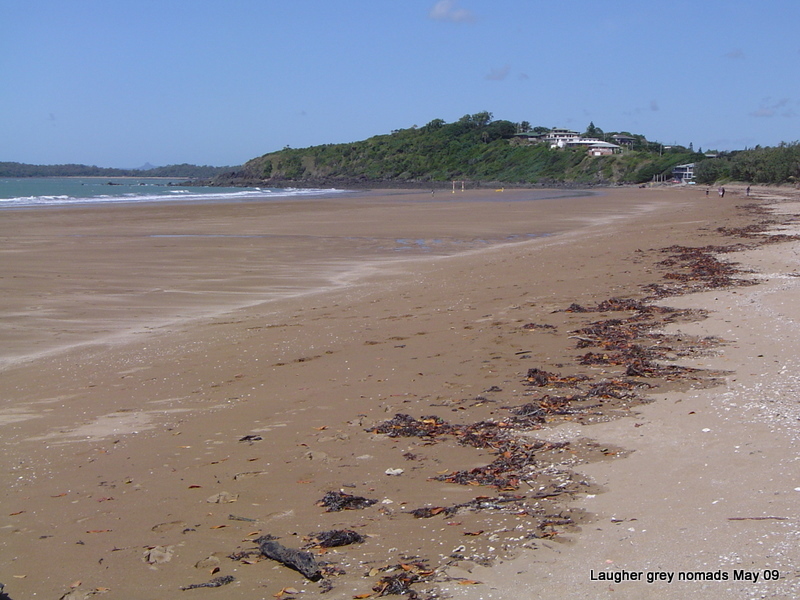 After Christmas I did a few little jobs I had been putting off in the back of the truck and then we decided to head for the coast for a few days. We copped a storm on the Saturday night with over 3 inches of rain (75mm). The awning and Suzi’s shelter both handled the downpour so we felt safe leaving Emerald for a few days, with a neighbour keeping an eye on things in our absence. Packing a few things into Suzi, we headed east. Took a slight diversion at Blackwater to have a look at Bedford Weir. The 3 inches of rain 36 hours back sure made the river run. 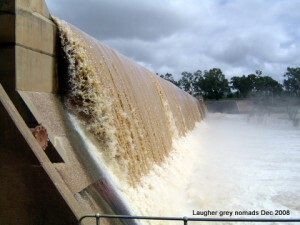 Bedford Weir, Blackwater - after 3 inches of rain. 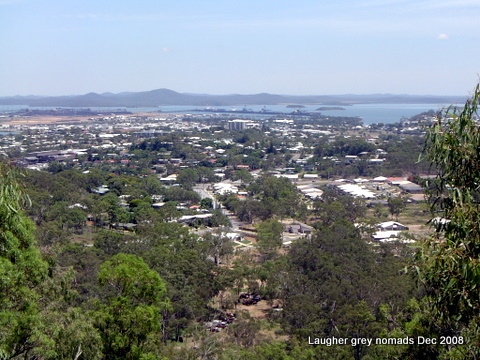 Approx 90km from Rockhampton we turned due south and headed to Biloela. The locals pronounce this as “billo-wheel-a”. We had a bit of a look around before heading due east again, hitting the coast at Gladstone. 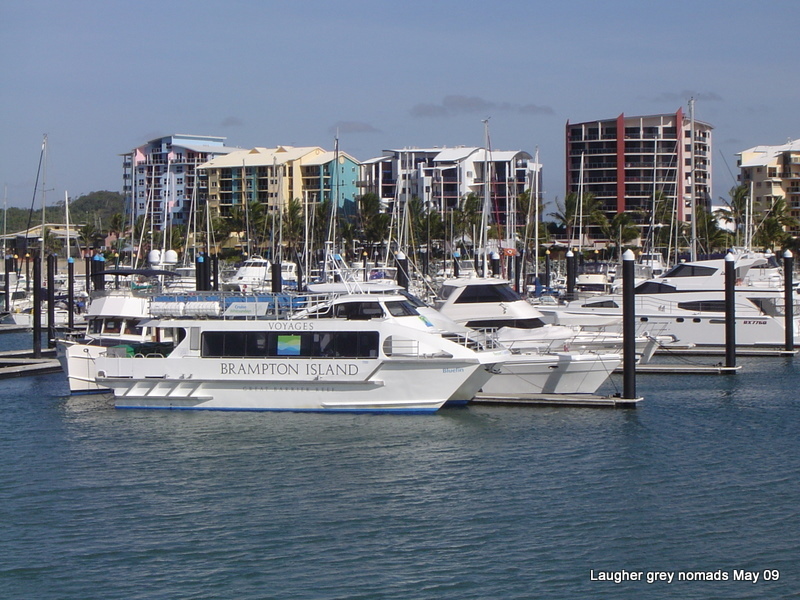 We stayed 3 nights in Gladstone, including New Years Eve. 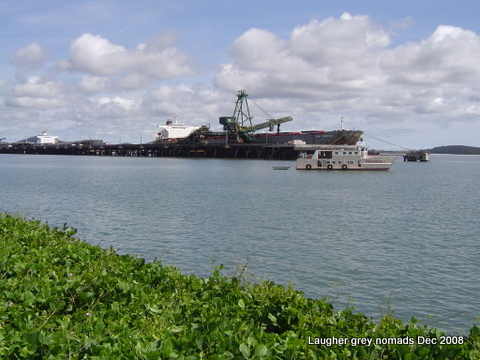 Gladstone is a mix of a working port with a big tourist trade as well. In the area there is also a big power station and an aluminium smelter. We both liked the town, it is a good example of how industry and tourism can co-exist. 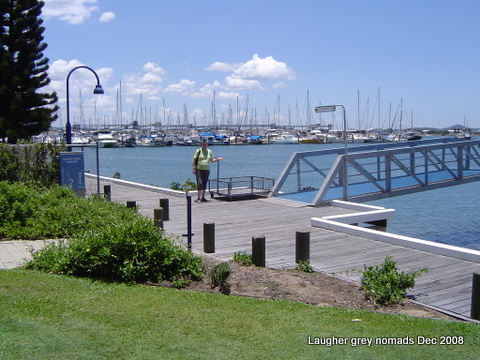 The foreshore area is very well maintained, with a recreational marina set amongst a large working port. 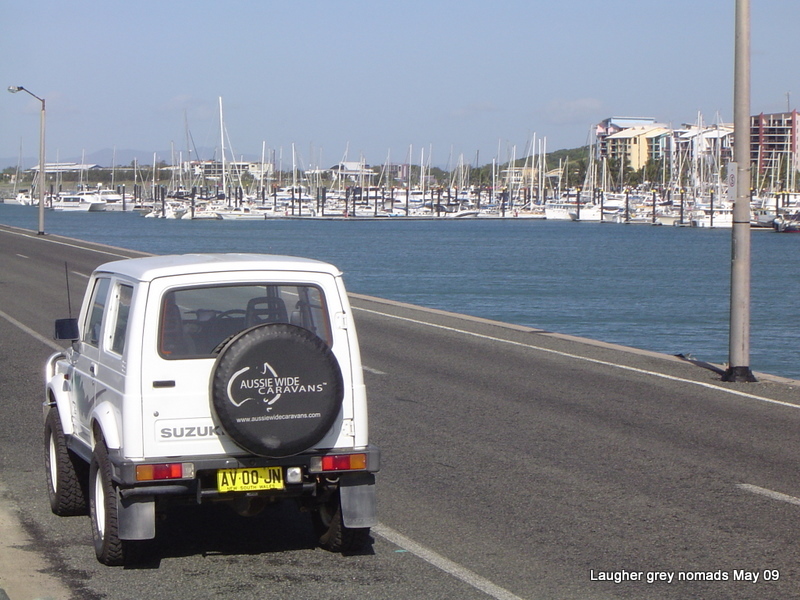 A short drive north up the coast on New Years Day had us in Rockhampton for 2 days. The area copped another downpour that afternoon and night. 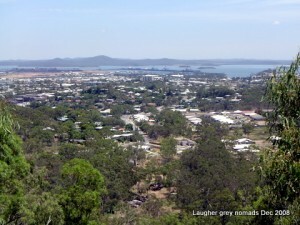 We had a good look around Rocky, did a bit of shopping and also had a run up the coast to Yeppoon. Sorry, no photos as it was wet and very humid. Plus we promised ourselves to spend more time there one day. 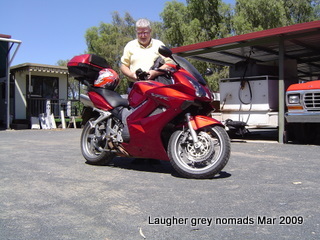 We set Suzi on a due west course for the 290km trip back to Emerald last Saturday morning. We both got one hell of a shock to see our awning down and looking very sick. The roller had a bend of at least a foot in the middle.The storm the night before had dumped 60mm in a short time. Somehow the rain pooled in the awning and got to be over 2ft deep in the awning, Neighbours released the water and then dropped the awning the next morning when they got up. Thankfully the only visible damage was to the awning roller. People commented to use that they have seen the whole side of a caravan pulled off in similar circumstances. Often the awning will tear. Once we got over the intitial shock we, with the help of our neighbours – Ivan, Linda and their 18yr old son Brad, had a go at straightening the roller. We managed to get it straightened a little but it still looked like as write-off. Without too many exceptions, all awnings around here have curved ribs fitted. These stop the water from pooling. I had even tried to buy some in Rocky, but the caravan parts business was closed till Jan 27th! After a lousy nights sleep I decided to have another go at straightening the roller – it’s 4inches in diameter and made of reasonably solid aluminium. Lo and behold, us 3 ‘solidish’ males managed to get it as good as new – much to everyones amazement. Seemed like a good cause for a celebration so Ivan and I demolished a slab of VB in the arvo. Nothing like turning up for a job interview the next morning with a bit of a hangover ! 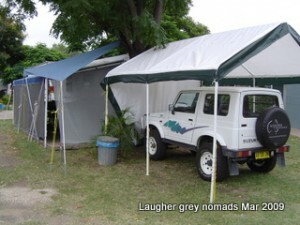 Awning and Caravan Manufacturers need to lift their game. When the actual manufacturer of the awning said we should have at least 2 curved ribs and one tension bar installed when I made an inquiry before Christmas (I have this in writing) I am a bit pissed of that no one suggested that I needed these items when we purchased the caravan. Why are they allowing such big awning (ours is 21ft long) to be installed without these items? I am going to follow this up. From what I can see, we are very lucky that we do not have to replace anything. Can’t work out why the awning handled 75mm the week before but then pooled the 60mm downpour. Can’t help but think they are a flawed design, although the second storm did come from a different direction. Should have taken a few telltale photos of all this but didn’t think of it till after the drama died down. The interview with a local telecommunications company went well. I also have 4 other options open at present. Jan and I are currently working through all the options and will choose the jobs that best suits us. Gee its nice to have 5 options to choose from. My guess is our next post will be good news on the job hunt front.